As your processes grow in size, you will need some way to manage their complexity. Notice that some Operators are containers; they hide the details of your process, and help to keep your top-level process relatively simple. Inside are one or more subprocesses. 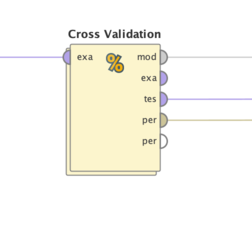 The Cross Validation Operator provides a good illustration: this Operator contains two subprocesses, a training subprocess and a testing subprocess. The design of the icon, as for all Operators containing subprocesses, suggests a hidden layer. Double-click the Operator to examine its internals; click on the Process link to return to the parent process. Question: How do I build my own container, with my own subprocesses? Answer: The Subprocess Operator is a generic container. Use it to create your own subprocesses. Add the Subprocess Operator to your process. Double-click to open it, then add whatever Operators you like. Select a subset of Operators from your process with Ctrl-click, then right-click the selection and choose the context menu item Move into new subprocess. A new Subprocess Operator appears, containing your subset of Operators. Since the Subprocess Operator is completely generic, it's helpful to rename it so that the name reflects your content. Right-click on the Operator, and choose Rename operator from the context menu. Right-click the subprocess, and from the context menu select Save as Building Block. 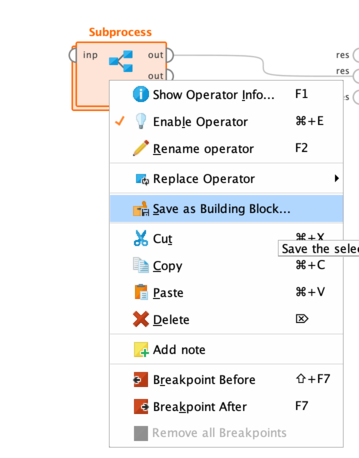 Your building blocks are saved as XML files (extension .buildingblock) in the .RapidMiner folder. From the main menu, select Edit > Insert Building Block. Make sure that in the Process Panel no Operator has been selected, or this menu item will not appear. Right-click inside the Process Panel, and from the context menu select Insert Building Block. To delete a building block, select Settings > Manage Building Blocks from the main menu, and choose the building block you want to delete. Notice that some often-used building blocks are bundled with RapidMiner Studio. In addition, the RapidMiner Community makes available shared building blocks, which you can find in the Repository under Community Samples > Community Building Blocks.